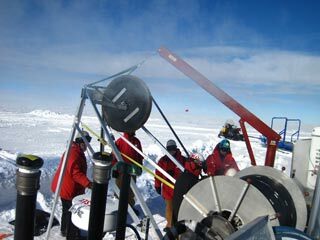 The Aero6gen unit (company info) was temporarily put up on a 20' tower; afterward the turbine was to be retrograded, and the tower sections were reused on the Whisper turbine at Site 2. 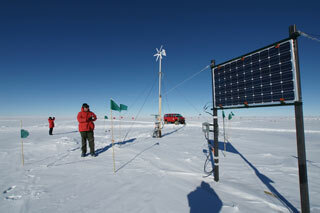 In the foreground on the box is a 235W PV panel, not yet mounted (2). Here's the turbine from another angle, with the PV panel mounted on a tower. The PV installation is to test the control system as well as the erection and mounting methods; the 300w turbine is being operated in various modes to check for noise reception in the buried antennas. Also in this photo are Kara Hoffman (left) and Michael DuVernois (3). Elsewhere, the three turbines were to be lowered and inspected. The Hummer turbine at site 2 was replaced with a Whisper unit on a new 30' tower (some of which was temporarily used for the Aerogen unit at the test bed. A replacement turbine was brought for the Bergey turbine at site 3, it was to be installed if needed. 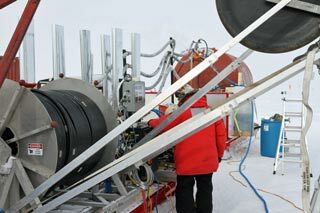 Otherwise there was maintenance, adjustments, and swapping of the control and instrumentation boxes. The turbines, PV panels, and associated equipment are not required for the first few antenna stations, which are close enough to the ICL to use station power and hard-wired data links. Briefly, ARA uses radio antennas to detect nanosecond-long radio pulses from high-energy neutrinos. These are believed to be produced by ultra-high-energy cosmic rays, perhaps emanating from supermassive black holes in nearby active galactic nuclei. 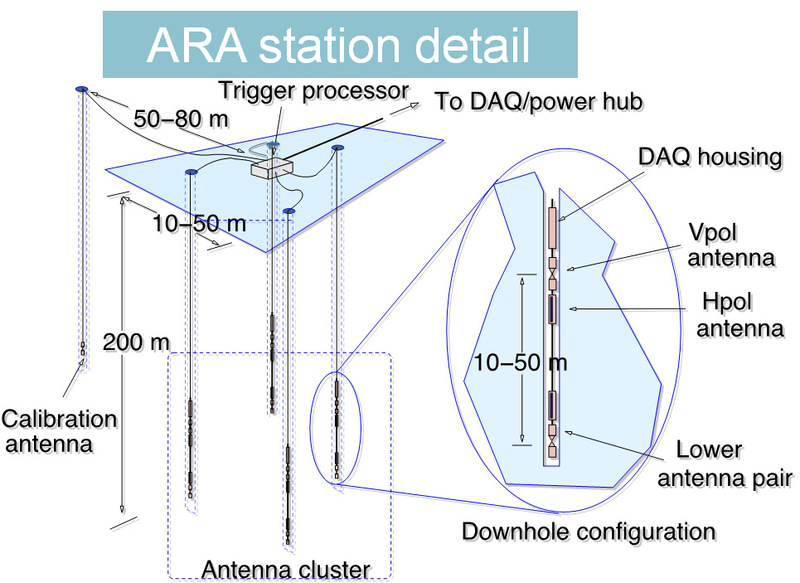 ARA uses the Askaryan effect, whereby charged particles can similarly emit radio or microwave radiation. 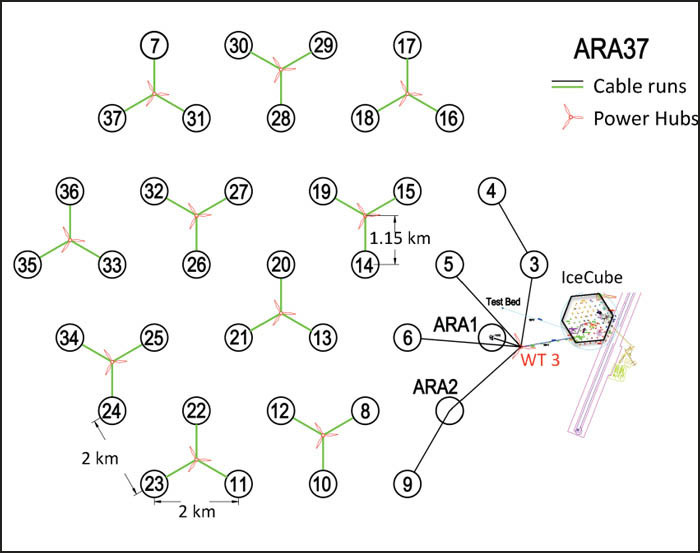 By comparison, IceCube utilizes the Cherenkov effect, where charged particles moving faster than the phase velocity of light can emit light radiation. Because ARA looks for high-energy particles, a larger array is required than that of IceCube. The technical details are available in the references below. 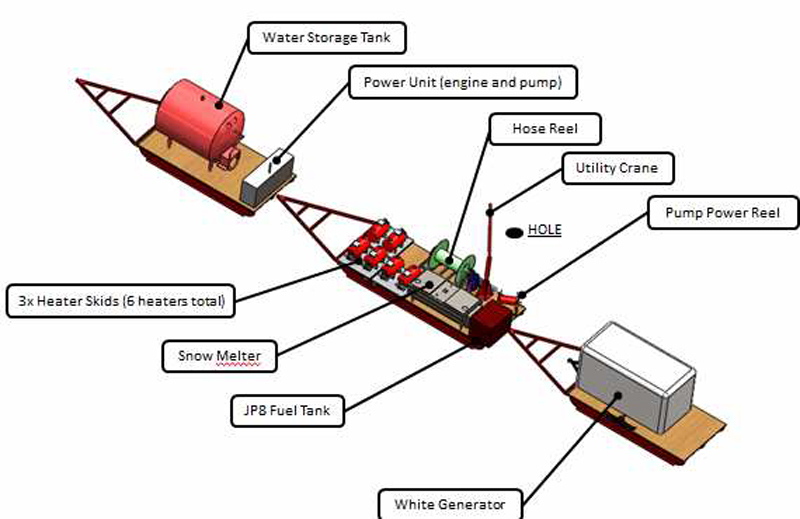 ...and a schematic layout of the equipment (5). 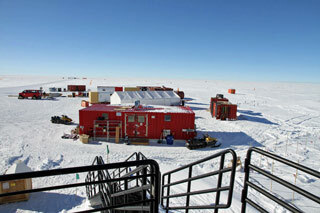 The ARA work area looking from the ICL balcony. 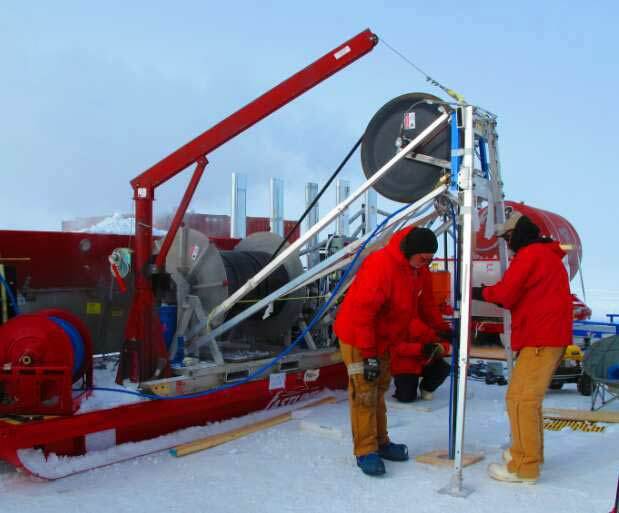 It is a much smaller footprint than the IceCube drill setup (6). A view of the drill train--the snow melter is in the foreground with the heaters behind it (7). From the other side--the hose reel looking toward the insulated water tank (7). 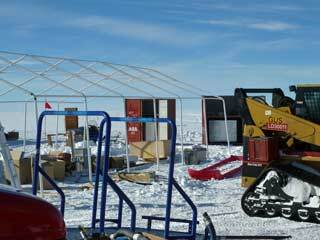 A view of the business end of the drill in operation (5). another look at the business end of the drill...this photo is actually from the 2010-11 testing (8). 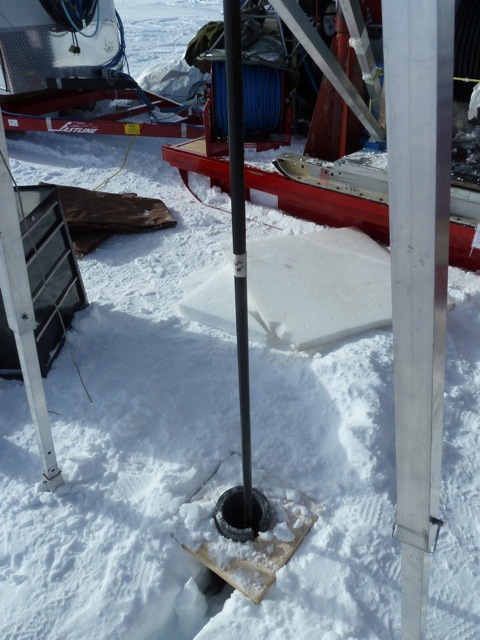 A closeup of one of the ARA1 200m holes (7). 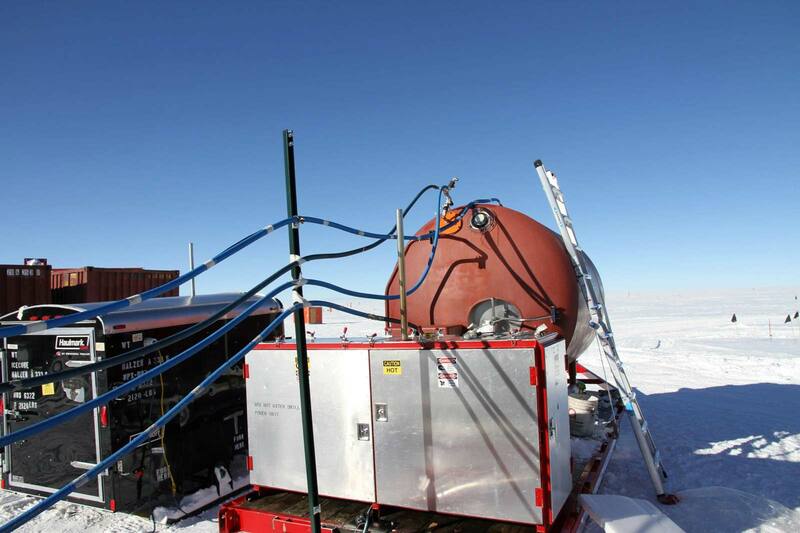 The insulated box containing the pump; behind it, the water tank (6). 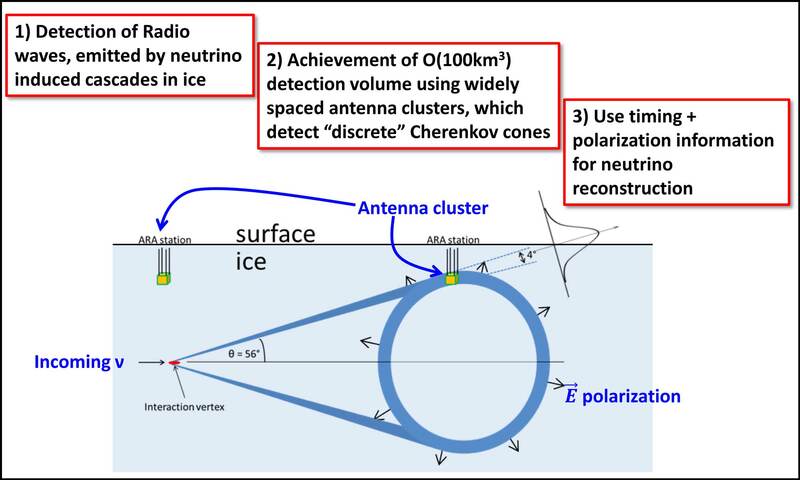 (1) "ARA: The Askaryan Radio Array," a report presented by Thomas Meures on 20 June 2012 at the Acoustic and Radio EeV Neutrino Detection Activities (ARENA 2012) conference in Erlangen, Germany. (2) IceCube news page; photo by Laurel Norris. (3) Michael C. B. Ashley; the photo appears and is described in his diary here. 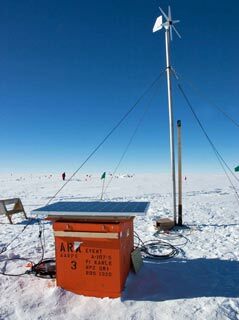 (4) "ARA: The Askaryan Radio Array," a report presented by Kara Hoffman, University of Maryland, presented at a 4-5 April 2011 conference "Astrophysics from the South Pole: Status and Future Prospects" in Washington, DC. 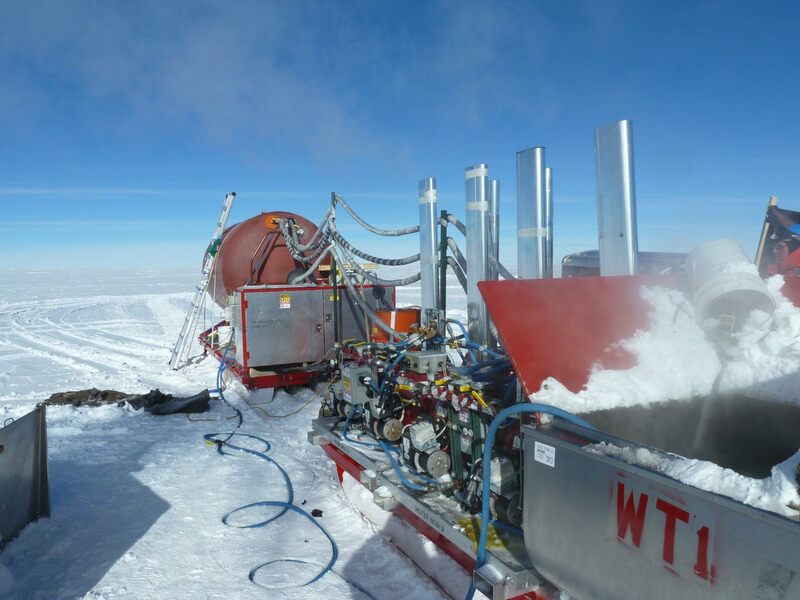 (5) "Radio detection of UHE (ultra-high-energy) cosmic neutrinos, a report presented by David Seckel (University of Delaware) at the Neutrino Oscillation Workshop, Conca Specchiulla (Otranto, Lecce, Italy), 14 September 2012. (6) Photos provided by Mike DuVernois. (7) Blog by Dr. Mike DuVernois. 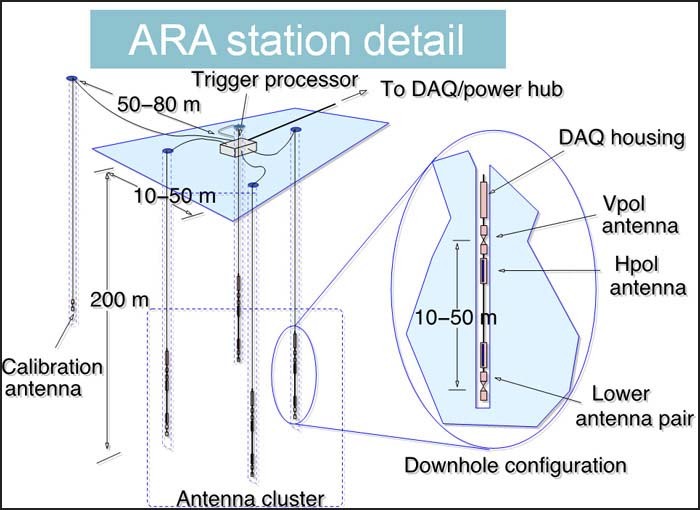 (8) The "photos" section of the Askaryan Radio Array UW project web site. (9) ARA-AARPS (ARA Autonomous Renewable Power Stations) Preparations and On-Ice Tasks (for 2011-12) by Ken Ratzlaff, Dave Besson, and Rob Young; Instrumentation Design Laboratory, The University of Kansas. Elsewhere: the the unusual ship offload at McMurdo.